The smell of the beach sand is crisp, the air salty from the ocean. The clouds above are full and not daunting. Hear the chatter of people, dressed in a skimpy swim wear, tanning under the sun. The distant sound of sea gulls and waves crashing against rocks sounds melodious. Children making sand castles run their fingers through the fine white sand which otherwise clings to your toes. 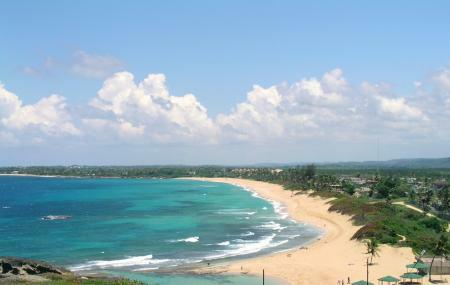 You are at the Carolina Beach at Puerto Rico. The Carolina beach is a well maintained beach, with restrooms, lifeguards, a fenced parking lot which charges a nominal fee, restrooms and showers. It is one of the five Blue Flag beaches, which means that the quality of the water is monitored and cleaned. It is a long stretch of white sand and offers enough space for people to spread out. It actually has a series of 3 beaches in a row with their own facilities. There's a kiddie water park at the eastern end of the beach. There are food kiosks, a couple of shops which rents chairs and a First Aid centre. During summer, the water is aqua marine with large palm trees providing shade. It looks like a postcard against the white sand and blue sky. This is a family friendly beach, so gets busy on weekends during summertime. There are picnic pavilions and barbeque grills where families can cook and enjoy a picnic, after paying a fee. You need to get in early to get parking and a shade under the palm or almond trees. During winter, the beach is almost empty. The surf gets a bit rough but the life guards fly flags to notify people if it is safe to swim. Only swim if the flag is green. The sand is very fine on the beach, so the first few feet of water is sandy from the breaking waves. There are vendors on the beach which rent equipment for water sports like kite boarding, and some selling refreshments. You can bring your own music, food, drinks but you may be fined for glass bottles. Another minor setback is the beach’s close proximity to the airport, meaning you get to hear the airplanes take off and land. So sleeping is not an option! The beach has been refurbished recently with the addition of a water park. They have collected sand from the natural waters and added that to the park area. Wear plenty of sunscreen and re-apply often. If you are on the beach for as short as 15 minutes without sunscreen you will be toast! At night expect a lot of noise as people party hard on this beach. The beach is wheel chair friendly. Lifeguards are very helpful getting handicapped people in and out of the water. The water is clear with just enough waves to feel these people comfortable. Entry to the water park for children is $5. It is not rocky so the beach is safe to walk barefoot, though flip flops are advisable. There is only a parking ticket for $4. The best time to visit is either early morning or later afternoon after the port of call sunbathers and swimmers re- board their cruise ships. This beach is located just north of the SJU airport on Route 187. From the Isla Verde area, simply follow Route 187 east for about 5 minutes. El Patio Latin Bar Cafe: Caribbean. Ristretto Cafe: Cafe, Delicatessen, Desserts. Di Vino Wine & Tapas: Tapas. Home Restaurant & Sports Bar: Caribbean, Diner, Hamburgers, Grills. How popular is Carolina Beach? People normally club together Pine Grove Beach and El San Juan Casino while planning their visit to Carolina Beach.